I’ve submitted a policy proposal to the Housing department at Brent Council to investigate, in terms of feasibility, a change in the way that the Council administrates the Disabled Facilities Grant for people who have their own home, but cannot move back into it due to accessibility issues. A Disabled Facilities Grant is a local council grant. It helps towards the cost of adapting your home to enable you to continue to live there. A grant is paid when the council considers that changes are necessary to meet your needs, and that the work is reasonable and practical. The Disabled Facilities Grant makes a world of difference to people in Brent. An elderly resident on Marley Walk was full of praise for Brent Council after she received a grant last year to install electronic controls to open and close her windows. She lives on her own and her arthritis and limited finger dexterity meant that she was experiencing great difficulty in reaching for and opening and closing her windows. Her new electronic controls through the Disabled Facilities Grant means that these troubles are no more! At the previous Partnership and Place Committee meeting at Brent Town Hall, I probed and uncovered a worrying trend for London. The Government’s Housing policy has made it unfavourable for developers to build 3 bedroom and above newbuild properties. Figures from the National Housing Federation have revealed the grim picture about Housing in Brent. Brent has the second highest waiting list for households on a waiting list. (behind Newham). The average house price in Brent is £322,904. The Gross income needed for a mortgage is a whopping £83,032. Bare in mind that this is before the unprecedented rise in tuition fees which makes these figures even worse for young people in the future who want to come onto the housing ladder for the first time. Martin Cheeseman, Director of Housing and Community Care, has been at the forefront of a campaign by Brent and London Councils to encourage the government to introduce changes to the benefits system that fairly reflects living costs in London. In a recent interview for The Guardian website’s housing blog, Martin outlines the risk of homelessness facing thousands and the vast costs to councils and taxpayers if the proposed changes go through as planned. He also points to the social problems that will follow including the creation of ghettos or ‘dumping grounds’ and the demise of sustainable communities that local authorities have worked hard to forge. Speaking about the recent announcement Martin said: “Brent has lobbied hard to get government to rethink their proposals which threaten thousands of people, with many families facing the possibility of leaving their homes and the lives they have built in the borough. “Postponing the caps does indicate that the government are hearing councils calls to rethink the proposals but delaying change is not addressing the concerns or the problems we will face from this type of benefit reform. “Brent and many other London councils feel these changes hit the poorest hardest making the most vulnerable – such as pensioners, carers, vulnerable adults and families – pay a huge price for the countries debt without offering sustainable results. The delay means that from April 2011 existing Local Housing Allowance claimants will have their benefit entitlement reviewed on the anniversary of their last claim and will then have up to nine further months before the new caps are imposed. Anyone making a new claim from April 2011 will be affected by the caps immediately. In a speech to Liberal Democrats’ spring conference in Birmingham on 13 March 2010, Teather said Conservative plans to abolish subsidised rents for Council and housing association homes would be a “total disaster.” She said their housing plans lacked substance, causing them to try and keep housing off the agenda. She said there was no “bearable” alternative to her party’s aim to invest £1.4bn in bringing 250,000 empty homes back into use. “The Tories think the only way to solve the housing crisis is to change the law so that it is easier for big developers to stuff vulnerable families in to houses the size of shoe boxes”. If you abolish subsidised rents for Council and housing association homes, all that is going to happen is that many more people will end up on housing benefit, and many fewer people will be able to work. Well that is now also Sarah Teather’s big idea as well. Liberal Democrat deputy leader Simon Hughes today warned the Prime Minister that fixed term council tenancy agreements “in no way represent the policy of the coalition”. Mr Hughes said David Cameron’s ideas for ending “council houses for life” had not been discussed within the coalition and “certainly do not represent the policy of Liberal Democrats”. Now in Government, the Lib Dems are abandoning what they signed for in Parliament when they were in opposition. Earlier this year, the Independent highlighted that it costs on average £201,000 to raise a child in Britain today. Parenting has changed, with many taking more responsibility for their children in many cases, up to and beyond 21 years of age. Helping them to progress through education, in some cases University, giving them a foot up onto the housing ladder; it’s all very costly and now an inevitable part of modern day parenting. Universal child benefit acknowledges and recognises that it is expensive to raise children in Britain today. Scrapping the Building Schools for the Future programme, halting Playbuilder schemes and freezing child benefits are just a few of the ways in which families have been bearing the brunt of the coalition cuts. We now see Sarah Teather and her Tory pals going further and removing child benefit from some parents. Yes, it may be the case that those on higher incomes may be able to afford raising a child without need for help from benefits. But is it fair that this move now makes some parents with children worse off than wealthy people who do not have children? The devil is in the detail of this Tory and Lib Dem policy. The benefit removal as proposed would leave households where a only one parent works and earns over £44,000 worse off and would leave parent households with combined incomes of up to £88,000 unaffected, so long as one of them is not earning over £44,000. That’s the problem with the Government’s proposals as they stand at the moment. It’s always those who are on the fine line, who could do with that extra bit of help, who end up losing out. That is why I am in favour of keeping the universal based approach. But, although many may agree with the principle of the Con Dem approach, the detail is ill thought out and would be unfair on middle income families. What would be a fairer approach to take is to have higher taxation on all higher income level earners, and not just penalise those who have children. Government should recognise the important role of parenting and acknowledge that bringing up children is expensive. The Lib Dem and Tory approach fails to acknowledge this. Ken was my MP for over half of my lifetime, so to many, it may not be surprising that someone from Brent is backing Ken to be Mayor of London. But looking beyond that, I want a candidate who is not afraid to challenge the consensus and someone who can build a platform for Labour to be back in power at the next general election. Ken has proved time and time again and shown true leadership in the decisions he’s made that he has shown good judgement. Some decisions he has made has made a practical difference to people’s lives. One example of when Ken has shown innovation to tackle the problems we have is on Housing; and in particular, wheelchair accessible housing. There is a national shortage of around 300,000 wheelchair accessible properties in the UK. In many cases, not having the right housing could mean that a wheelchair user has to bathe in the kitchen sink or even use their living room as a bedroom, because they can’t get into their own room. In London, thanks to Ken, it is now a requirement for ten per cent of homes to be identified as wheelchair accessible at the planning application stage and described in the Design and Access Statement submitted with the planning application. The requirements go well beyond the National Lifetime Homes standard and shifts the focus on building homes for wheelchair users that are liveable, and not just visitable properties that tick minimum requirement boxes. Ken’s 10% target has set a blueprint that leads the way on this issue, and although it will not solve all the problems we face on this issue nationally, Ken’s actions ensures that London at least give our contribution. On Transport, Ken was right to introduce the Congestion Charge in London to ease traffic through the city, encourage greater use of public transport and reduce vehicle emissions. The Boris alternative to removing the Western extension to the Zone has been unprecedented rise in Tube fares LINK. Whether it is housing, transport, planning, employment, fairness, IRAQ!!! in most cases, Ken gets it spot on. 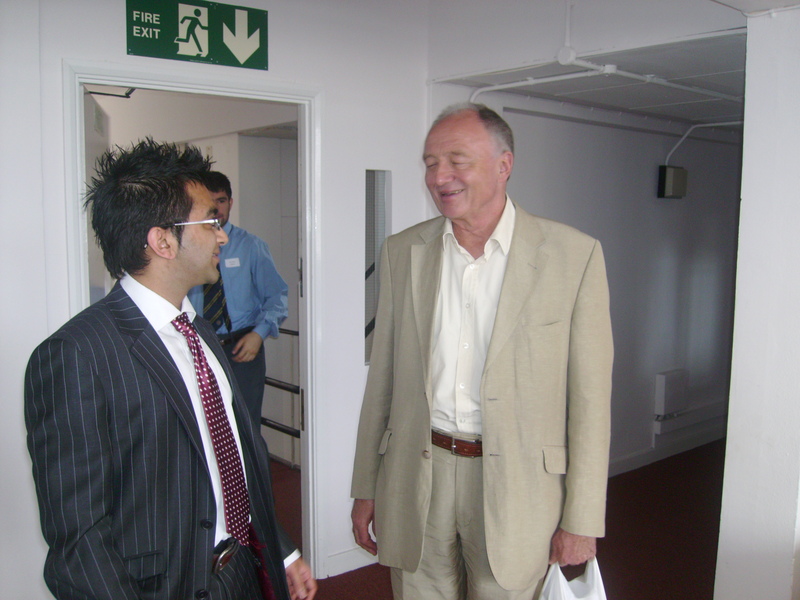 That’s why I’m backing Ken to be the Labour Party candidate for the 2012 London Mayoral election.